The University Museum of Ṣanʿāʾ was the first museum in the Yemeni universities, built in 1983 to fulfil the educational and training needs of students of archaeology within the Faculty of Arts and Humanities. The University Museum of Ṣanʿāʾ houses a quite rich South Arabian epigraphic collection, including about a hundred texts. Most of the inscriptions preserved in the museum come from the al-Jawf region. 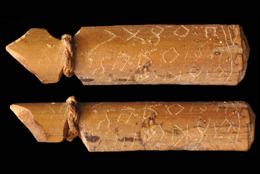 They include texts in Sabaic and Minaic languages, such as some long legal inscriptions, which are complex from the linguistic point of view and interesting in the cultural perspective. Though badly preserved, there are also some remarkable artefacts, such as incense burners with truncated pyramidal base and blocks decorated with a bull’s head, crescent moon and disc and false window motifs. A group of four funerary stelae with figure in relief, from not always specified Sabaean regions, represent in a quite primitive and rough style armed men engaged in war or hunting scenes. The University Museum of Ṣanʿāʾ was inventoried within the CASIS project in July 2009 and November 2009. Photos are courtesy of the Ṣanʿāʾ University Museum.